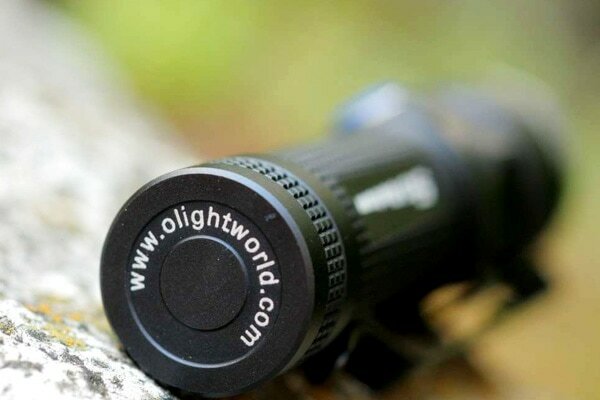 This S15 Baton was the latest in the S-Baton line from Olight in 2013. It offered an XM-L2, and can use 1, 2 or 3 AA batteries. Or a single 14500 cell. I`ve was drawn more towards AA type flashlights in 2013, and the Olight S15 seemed to be a nice addition to the AA family with its 250 lumens from a single AA battery. An AA extender to use with 2AA batteries. The S15 baton is well made. Its head is a little wider than the body. 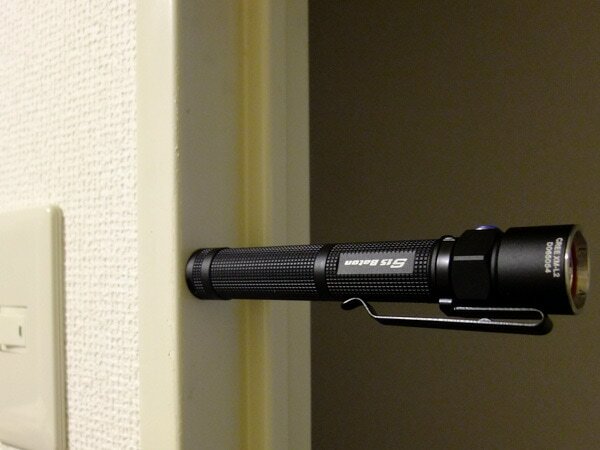 The clip is fairly strong, and helps with grip. One of the first things that drew my attention was the blue switch-button, which feels great. The engraving is also nice thick and sharp! The XM-L2 is very well centered. I used to own a Eagletec D25A, and one of the things I didnt like, was the size, too tiny, light and thin. 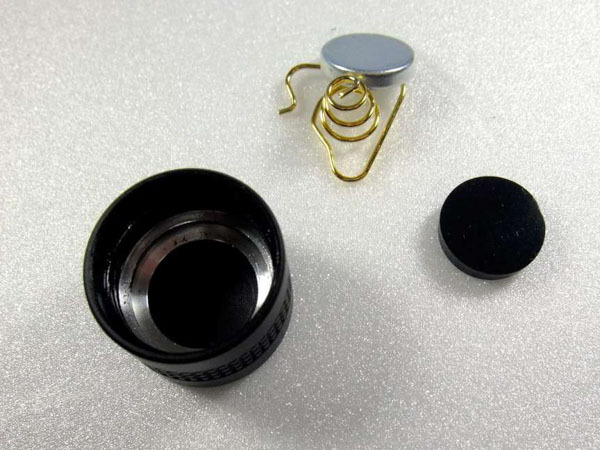 (87mm x 17mm, and 25grams). I also owned the infamous Xeno E03 (97x21mm 48gram), which I liked much more due to its size. 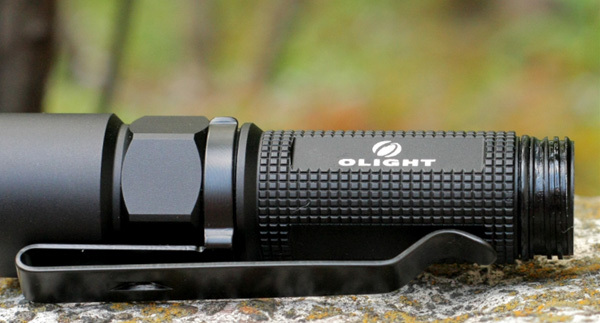 And the Olight S15 baton is again a step back from the Xeno E03 due to its size and weight, but not as bad as the Eagletac D25A. I prefer something heavier, bigger. In the tailcap is a fairly strong magnet. So you can attach it to metal objects, which can be very helpful and handy at times. 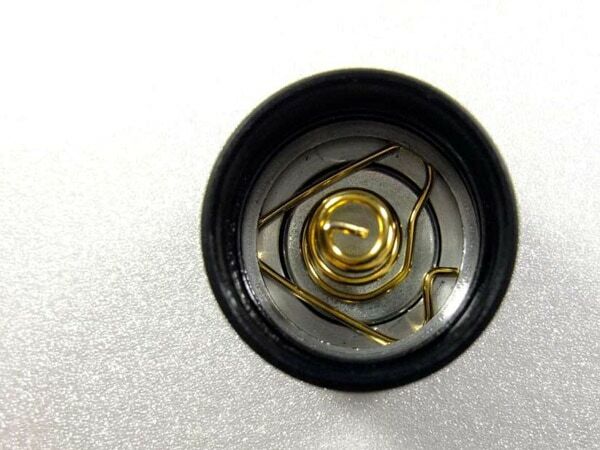 The magnet however can be taken out and replaced by a rubber ring. 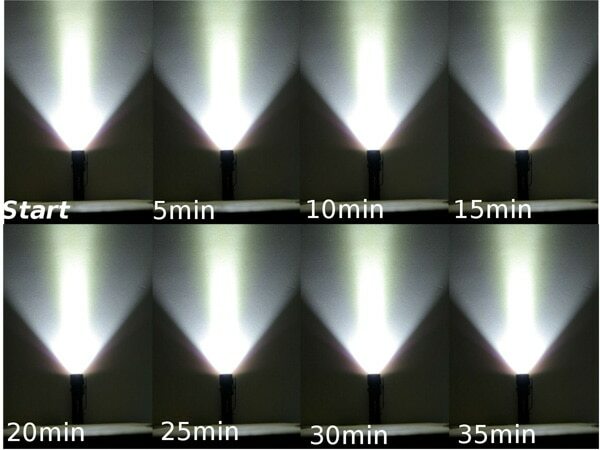 The light has a few short-cuts to its output modes. Pictured below are the Olight eos i3 titanium, M5, Olight S15 baton and the Sunwayman V11R mirage. The included magnet in the tailcap is very strong. 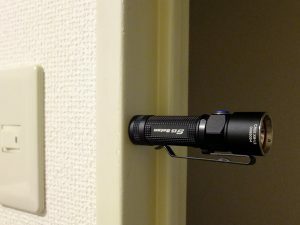 It easily holds the light in different posititions even with the extender and 2 AA batteries. You can replace the magnet with a circular coin like rubber that is included in the set. The first negative impression on this S15 was the UI. After using it for a few days I got a little more used to it, but I still dislike it. From OFF: short-cuts to 3 different output modes. Moonlight mode is not part of the main modes, and therefore inaccessible from the main modes!!! If you want to go back to moonlight, you have to turn the light off, and then Press and Hold the switch again for 1 seconds. This is far from useful. It has Strobe, but it's hidden, which is a huge PLUS. Enter it from any mode, inclusing moon-mode by 2 fast clicks. To get out of the strobe mode, simply press and hold the switch for 2 seconds. This will bring it back to the 3 main modes, low medium and high. press and hold for 2 seconds, it turns to Moon-mode and directly off... THEN release the switch. Now its locked.. If you click on the switch, nothing will happen. Except: 2 seconds press and hold, for Moonlight. 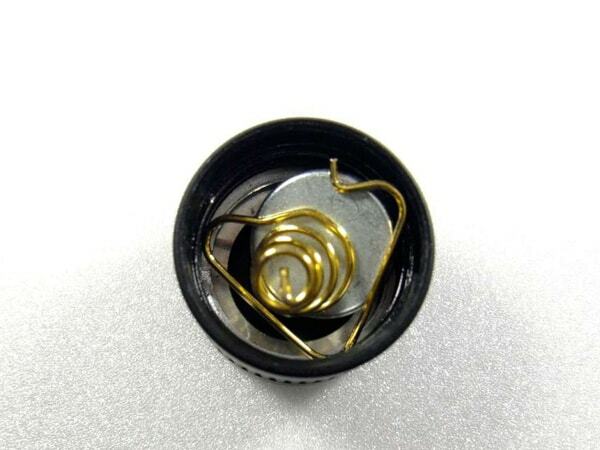 If you want a mechanical lock out, untwist the tailcap that breaks the circuit. This is safer and simpler. You wont have parasitic drain this way. One more thing that I noticed with this light, is that when you click the switch too short, it turns back on again. I would prefer to have this setting removed from the S15 successor. It has mode memory. So any mode will be memorized once its turned off. As far as I could test, there was no lag. So, turning it off and quickly on again will work as well. (not double click). Like with all other AA flashlights reviews, I used an AA eneloop battery: Runtime on High is; around 50min. After that it drops to Low, where it stays for a little longer. The S15 has no Low Voltage indicator or warning. 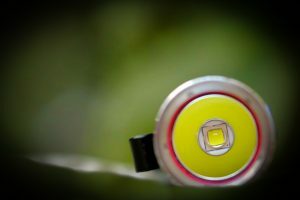 At this point the battery will be depleted, but you have time to look for another battery in mean time, as it will have a few lumens until it dies. AA batteries and 14500 lithium compatible. Can run off 2 and 3 AA batteries using extender(s). Very long runtime in Moonlight. 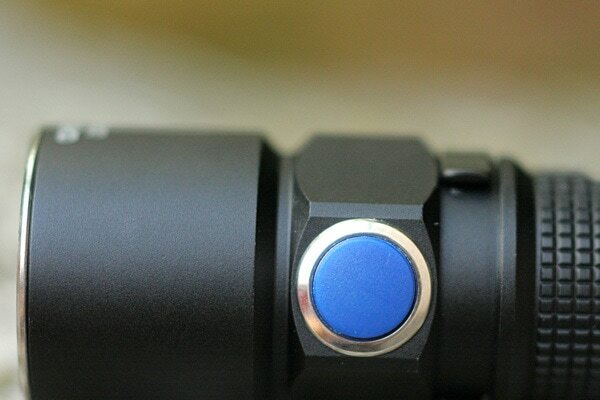 When removing the clip it leaves scratches and markt on the anodizing. 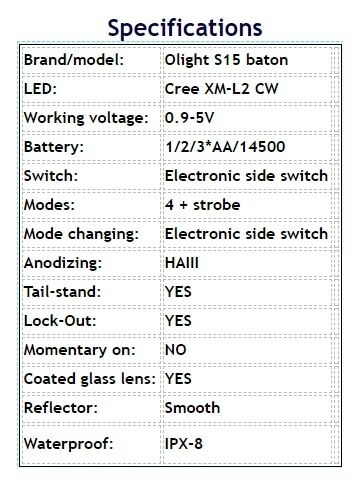 Not easy to modify and change led. Press and Hold to change modes.. A horror to use. Because of the side switch it can activate the light accidentally and drain the battery. Entering the Electronic Lockout is difficult to achieve.